Papercrafts by Patti: Finally Friday! I was waiting for a color challenge instruction, but none came. This is my own color challenge! I saw a baby blanket with these colors on it and I tucked it away in my head and here is the result of using Red, Black, Gray, Pink and White. I stamped one of my Oval All sentiments onto an oval die cut from Nestabilities and framed it with another scalloped oval. I ran the pink background and the red tab punchout through the Big Shot in the dotted Cuttlebug folder. I used the gray taffeta ribbon to finish my design. I hope you like my creation and I hope you have a wonderful weekend! 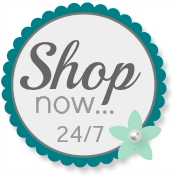 If you feel like shopping this weekend, please shop with me 24/7! Adorable! You did a great job with the colors! Excellent color choices . . . you should volunteer to host a Pals Challenge. Denise is going to be the "go to" Pal on future challenges . . . but you could always suggest a color twist. Delightful card. I love your color choices here! Awesome!